The comments come days after Kent Hehr's resignation. Prime Minister Justin Trudeau speaks at the Liberal national caucus meeting on Parliament Hill in Ottawa on Sunday. 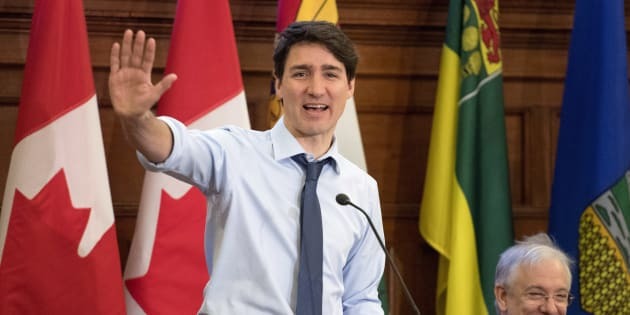 OTTAWA — Thwarting inappropriate behaviour amongst those who wield power and building on international trade agreements are both essential elements to creating a better country, Prime Minister Justin Trudeau said Sunday as he rallied his party's caucus. A day before Parliament was set to resume sitting after its winter break, Trudeau told Liberal MPs that change is needed to encourage more women to enter politics. "Add women, change politics is how we will make a better country," Trudeau told the gathering as he referenced a women in politics social media campaign the prime minister said was more than just a hashtag. "Sexual harassment is a systemic problem. It is unacceptable." His comments came as the recent fast-paced movement against sexual misconduct, which saw the resignations since Wednesday of the Progressive Conservative party leaders in Ontario and Nova Scotia, was felt within the federal Liberal caucus room. Absent from the meeting was Trudeau's former sport and persons with disabilities minister, Kent Hehr, who resigned last week after being accused of sexual misconduct while he was a member of the Alberta legislature. While Hehr remains a member of the Liberal caucus, the Prime Minister's Office said he decided not to attend the meeting. Had he been there, however, Democratic Institutions Minister Karina Gould said she wouldn't feel uncomfortable by his presence. "Sexual harassment on the Hill is a very serious issue, and we need to take it seriously," she said. "But we also need to make sure that we're allowing due diligence." Karina Gould holds a press conference in Ottawa on June 19, 2017. Other Liberals, however, struggled over questions of why Hehr was allowed to remain in caucus while a fellow Alberta MP, Darshan Kang, resigned from the party's caucus last summer after being accused of sexually harassing two female employees in his office. Kang has denied the allegations. Members of Parliament were expected to debate legislation Monday, Bill C-65, which would strengthen sexual harassment protections for federal employees, including those working on Parliament Hill. As Sunday's caucus meeting began, Trudeau also boasted about last week's signing of a new, comprehensive international trade agreement — known as the CP-TPP — that he said included significant gains for Canada over the former Trans-Pacific Partnership approved by the previous Conservative government. The prime minister said his government hopes to make similar gains during negotiations of a new North American Free Trade Agreement with the United States and Mexico. Prime Minister Justin Trudeau attends the World Economic Forum (WEF) annual meeting in Davos, Switzerland on Jan. 25, 2018. As the sixth round of talks to reach a deal were wrapping up in Montreal, Trudeau also set aside nonpartisanship over NAFTA, accusing the Opposition Conservatives of being willing to bend to U.S. demands for changing the pact. "They wanted us to sign the Trans-Pacific Partnership with no improvements," Trudeau said of the Tories. "And if they had their way, we'd give into American demands on NAFTA." While visiting Washington earlier this month, Conservative Leader Andrew Scheer said his party was united with the Liberals in seeking an updated NAFTA. Scheer has in the past, however, accused the Trudeau government of not properly spelling out a plan for the NAFTA talks.